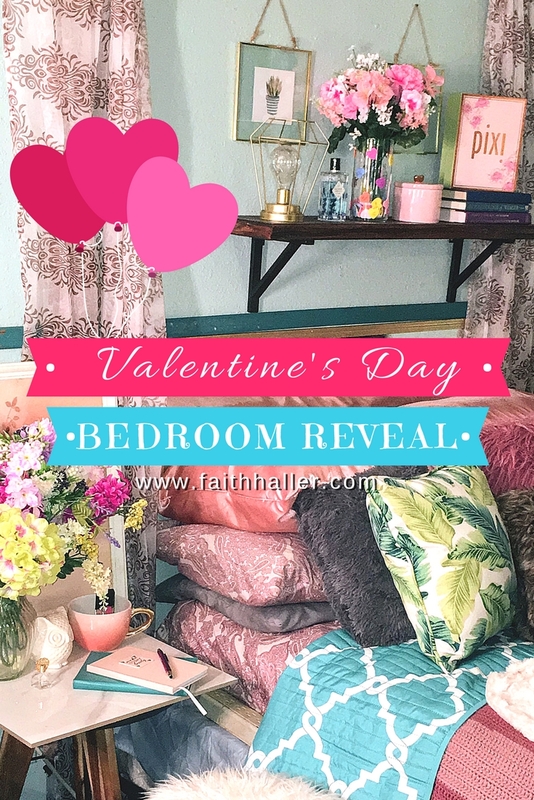 I'm not much into pagan holidays but I must admit as an artist I love to be creative and because I've been getting back into Home Decor I thought it would be fun to share how I updated my space for Valentine's Day in the most affordable way. Valentine's Day decor doesn't have to be your typical frilly nilly decor with hearts all over the place, pink & red themed. It can be something that can remain a part of your space and age appropriate. So today I'm revealing how I added a touch of love to my space. If you follow me on Instagram then you will know that I love flowers but you must also know I prefer Synthetic flowers because although I have a window I don't get much sunlight in there to nourish plants so I personally opt for synthetics for maintenance purposes. I have flowers and plants all over the place in my space because plants creates a sense of balance and vibrant energy. 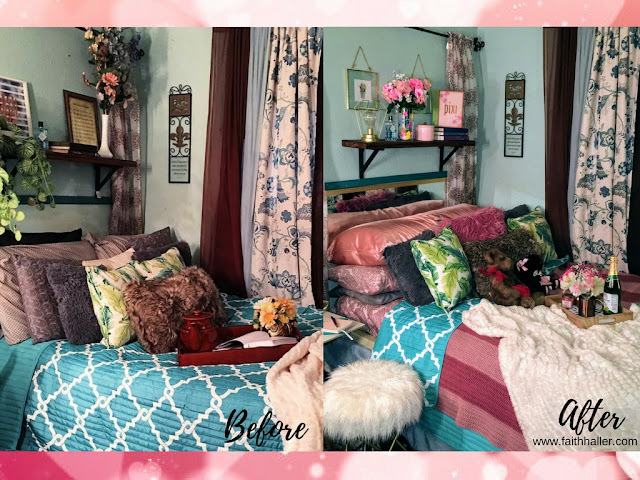 So the first thing you will notice is probably a difference in my mantle feature over the bed or maybe it's the bed? Oh well we're going to start with the mantle piece. This mantle piece definitely got an major upgrade and what I said about the frilly nilly valentine's decor I promise you that you won't see anymore imitation candy hearts. I thought it was cute and now I have something to pull out every year. This is also a great gift. I can recycle the flowers into another vase after the Valentine's Day holiday. As you can see my bed definitely got a major makeover. Can you feel the love in this room!? Blush tones add the perfect amount of contrast. A little close up on my table tray that I found at Target for only $5. What a steal! Also you must know every floral arrangement that you see in these photos were created by me. Another transformation was definitely my bedside table. TOTAL SPRING VIBES Right? I pulled out my marble slab that I got from Home Depot and placed it as the new surface to lighten the space. Added a oversized photo which you can't see much of but i do feel that it gets rid of some of that negative space on the wall..
A space inspired by love doesn't have to be so cheesy neither does it have to be expensive. This is a space I didn't spend much money on but I put a lot of love and thought into it. And it's also a space that I feel I don't have to change as the holidays changes.